The Night of the Radishes in an annual event held each December, in the plaza of Oaxaca City, Mexico. It is an exhibition of exquisitely carved radishes, that are entered into a contest for cash prizes. The carvings are everything from Nativity scenes to buildings, celebrities to saints, and animals to inanimate objects. Other organic materials may decorate the sculptures, but the radish is the main component. Radishes are grown specifically for this event. They are left in the ground long after they are ready for harvest and heavily fertilized to ensure they grow large and into unusual shapes. These radishes are known to grow up to 10 pounds, and be up to 20 inches in length! There is no official documentation of how the radish festival came into being. However, it is believed that Francisco Vasconcelos Flores started the exhibition of the radish sculptures. In the 1800s, vegetables were sold in an open market during the Christmas season. In order to differentiate the radish from other vegetables, tiny sculptures were carved out of the small radish roots. Women loved the little sculptures, using them as table decorations for their Christmas feasts. In 1897, Flores, the current Mayor of Oaxaca, decided to showcase the unique radish carvings in an exhibition, and thus the “Night of the Radishes” was born. Have you ever carved a radish? Radish carving begins 3 days prior to the festival. Most of the sculptures are carved by adults, but children also participate. Many children learn the art from their parents, which is passed from generation to generation. Two other categories are part of the event: Folk art made from corn husks, and from dried flowers. On the day of the festival, the radish sculptures and corn husk/flower art are showcased on the plaza of Oaxaca City. The exhibitors set up their art on tables in a fenced off area. After judging, winners are announced on the evening of Dec 23rd. The first place prize for the best radish is $13,000 pesos, or around $1,300 US. Will You Attend "Night of the Radishes"? I'm a big fan of festivals and events, and also love folk art. While I have not personally attended this festival, I would like to witness it first hand in the future. 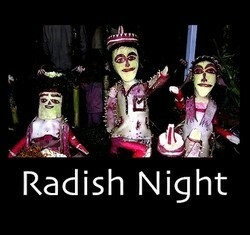 Have you ever attended Night of the Radishes, or other festivals such as this? It is passed down over generations. I really love the things they do with these sculptures. I only wish I was as talented. How interesting! I've seen carved vegetables on buffets, but never heard of an event based solely on radishes.